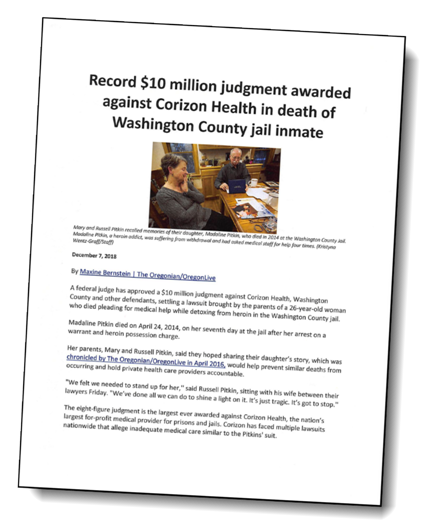 A federal judge has approved a $10 million judgment against Corizon Health, Washington County and other defendants, settling a lawsuit brought by the parents of a 26-year-old woman who died pleading for medical help while detoxingfrom heroin in the Washington County jail. Madaline Pitkin died on April 24, 2014, on her seventh day at the jail after her arrest on a warrant and heroin possession charge. Her parents, Mary and Russell Pitkin, said they hoped sharing their daughter’s story, which was chronicled by The Oregonian/OregonLive in April 2016, would help prevent similar deaths from occurring and hold private health care providers accountable. Download a PDF of the article from The Oregonian.